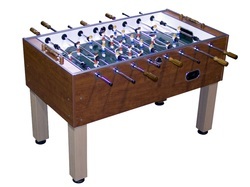 This is a furniture grade table stained in a Cognac color and designed for any game room. The Lifestyle series also comes in Oak and Black Diamond colors, but all of the parts are the same except the outside table apron color. 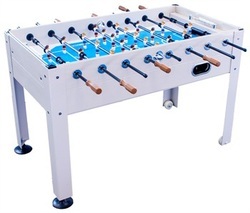 Equipped with wooden handles, traditional style foosball men, side ball returns, and a single goalie design, this table is the higher end table manufactured by Park and Sun. The legs on this table are a solid 4 inches by 4 inches for added stability for rugged play and the outside cabinet apron is stained with a cognac color. Keep score with the matching wood scoring units at both ends of the table. This foosball table is priced at around $500 US.